This playful yet sensitive, and deeply uncanny set of pencil on paper drawings initially rendered from the artist’s imagination as she sat in various waiting rooms within Moorfields Eye Hospital in London. The images of bodies were conceived over the course of many unsettling months as she contemplated the sudden blindness of her right eye following a traumatic incident in 2017. “She Summons an Army” references two important themes in Boswell’s oeuvre: the artist’s constant search for ‘ home’ as well as her ongoing salute to women who use their bodies in protest when they are not permitted to use their voices. As exhilarating in style as usual feast your eyes. 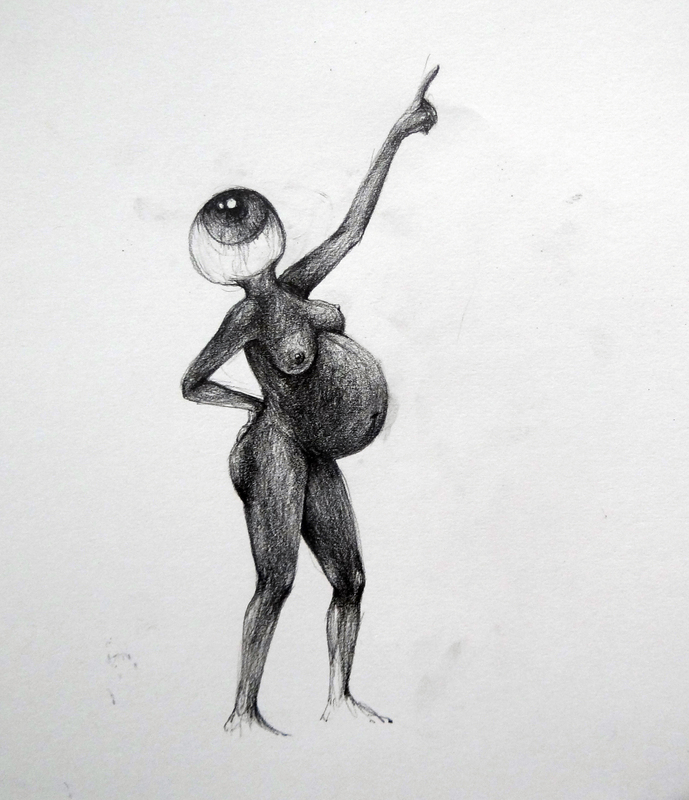 Phoebe Boswell “She Summons an Army”, Untitled 4, 2018 Pencil and paper 11 3/4 x 16 1/2 in 29.7 x 41.9 cm. courtesy Sapar Contemporary and artist. Phoebe Boswell (b. 1982, Kenya) is a multimedia artist who lives and works in London. Born in Nairobi to a Kikuyu mother and British Kenyan father, and brought up in the Arabian Gulf, she combines traditional draftswomanship and digital technologies to create layered works anchored to an inbetween state of diasporic consciousness. Boswell studied Painting at the Slade School of Art and 2D Animation at Central St Martins, and her work has been exhibited with galleries including Carroll / Fletcher, Kristin Hjellegjerde, InIVA and Tiwani Contemporary and has screened at Sundance, the London Film Festival, LA Film Festival, Blackstar and CinemAfrica amongst others. She participated in the Gothenburg International Biennial of Contemporary Art 2015 and was commissioned to make new work for the Biennial of Moving Images 2016 at the Centre d’Art Contemporain in Geneva. Boswell was the first recipient of the Sky Academy Arts Scholarship, was awarded the Special Prize at the Future Generation Art Prize 2017 for her interactive installation Mutumia, which consequently showed as part of the 57th Venice Biennale, and her work is part of public art collections including The Studio Museum in Harlem and the UK Government Art Collection. She is currently a Somerset House artist-in-residence, a Ford Foundation Fellow, and is represented in the US by Sapar Contemporary, New York.